Heather Ridout (Australian Super Chairperson) has been banging the table on gender diversity at the board level of Australian companies, and right she should. Only 22% of Australia’s top 200 listed companies have women on their board – not a majority, not the Chair, just at least one – and Australian Super has been writing them letters asking why. Well one company that has a best in class Chief Executive, who happens to be a woman, is Mirvac – Sue Lloyd Hurwitz – and she is a shining light of strategy execution. The problem for Sue is that she inherited a bit of a dog’s breakfast – a somewhat typical diversified, conglomerated property company that has diversified and innovated over time, with good intentions, but has predictably left it as a partially vertically and horizontally integrated mess. For us, that’s great, as when you open the door and it’s a mess, more often than not there is latent value in the bones. Sue no doubt saw the same thing when she was offered the job. As value investors we need to back management teams with a plan – as at the end of the day we can identify value, but it’s not really our job to unlock it – it’s the job of management - we just provide the capital. Sue’s got a plan and it’s being followed. Fortunately for us the market is not giving the company credit for it, and thus the stock is cheap. We only own two Australian REIT stocks in our Fortius Global Value Properties Fund, and Mirvac is one of them. Baby Boomers will remember when Mirvac, particularly its residential division, was synonymous with quality. One of our investors used to be a member on the Board of Directors of Mirvac for many many years; and having known him for 19 years he epitomises quality and attention to detail. However in the early 2000’s this quality culture at Mirvac was largely lost, in part due to the desire and necessity to compete with the antithesis of quality, Meriton et al, and partly as the focus and ethos shifted to chase the allure of corporate actions. Now Mirvac is doing three things well – and if you are doing three things well, that’s usually two more than most. Those ‘things’ are Residential, Urban Retail and Office. People don’t often associate Mirvac with strong office credentials, because they are more used to seeing the Mirvac brand at The Broadway or Rhodes Shopping Centres or on a pre-sales advertisement in Domain newspaper insert. However Mirvac has one of the strongest office portfolios in the country at the moment and the market isn’t giving them credit for it. 44% of Mirvac’s capital invested is in office, but what I like most and find most encouraging is that they are selling some of this office portfolio (mostly in half shares and via ‘capital partnerships’) – the timing is good to being selling offices. So not only do you have a really good portfolio, but you have a management team that is making good capital allocation decisions. This is somewhat contrary to some of their competitors which keep running with slogans such as “Australia’s largest owner & manager of quality commercial real estate” - which just says AUM accumulator to me, which is not where we want to be invested. And why wouldn’t you be selling to recycle with assets trading so far above replacement costs (the replacement cost argument is one for another day). Lloyd Hurwitz came into the job in late 2013, she swiftly repurposed the management teams to pursue what they call the ‘Urban Strategy’, and while this is obvious for office and residential as this is where the density in these sectors is greatest, it’s really in the retail that this strategy is making the difference for Mirvac. 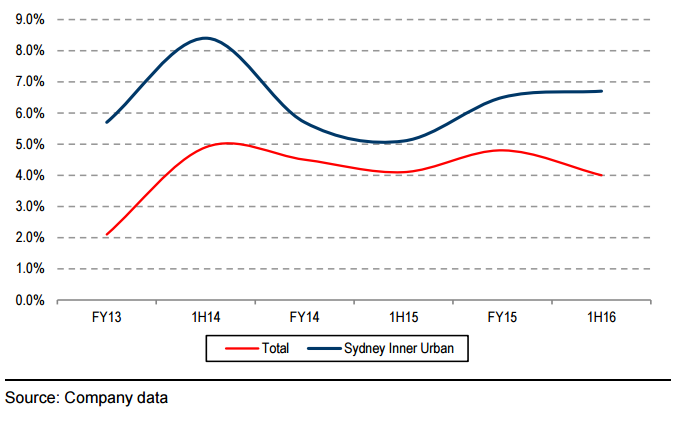 Have a look at the chart below (Figure 1) showing how much rental uplift Mirvac is getting upon new lease negotiations from its mostly urban retail portfolio compared to its competitors whom are more suburban. 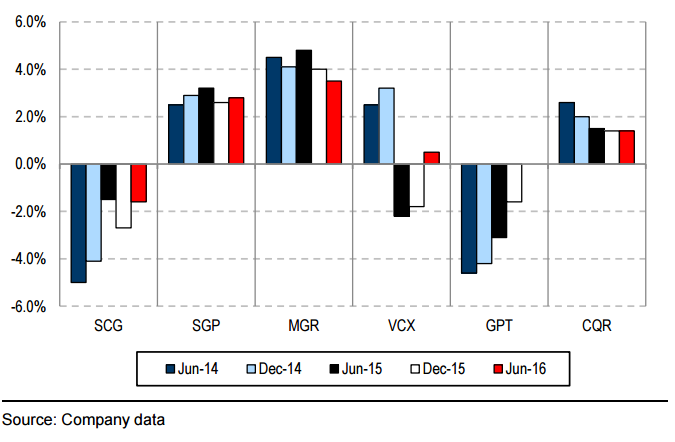 Credit Suisse describes Mirvac’s retail portfolio as “vastly transformed” and they are right. And lastly on the residential front we believe Mirvac is back to its best. We operate in the direct real estate space every day and we know what is well designed, well built and what will sell..... and what isn’t and won’t. I think one of the great examples of Mirvac being back to its best is in Harold Park in Glebe in Sydney. If you get a chance head down to the urban retail precinct called the ‘Tramsheds’ – it’s a really good example of urban retail and it complements the high spec residential that sits on the old trots track behind it. Mirvac’s capital allocators and development teams are starting to operate in harmony and if they pull off the build-to-rent model that has been mooted in the press (and they will) it’s a whole new ball game for Mirvac residential and the sustainability (and value) of its development business. People often say to me, “yeah but what is the catalyst”? Well we don’t invest for catalysts, we’re not an ‘event driven’ hedge fund, and have no desire to be. We’re not seeking to be on the yearly performance league tables – as more often than not, as my father says “today’s rooster is tomorrow’s feather duster”. We are value investors, and as Warren Buffet says, focus on the cash, because you want to own companies where if the stock exchange shuts down tomorrow, the profit is still being generated, harvested and reinvested into perpetuity without the need of the listed market. Value investing takes 2 to 5 years to see value recognised and ascribed by the investment majority. As alluded to above the big sleeper for Mirvac is that the market isn’t ascribing what could be called reasonable value to the development business – whereas they love paying up for Westfield/Scentre’s ‘rock-star’ development business. That’s fine by us as we’re happy to sit and collect the high yield (5.0%) while investment banking teams are beavering away in the towers around me trying to piece together the solution to unlock value, and if they don’t Sue’s team is already doing it, and will keep on doing it, in a slightly less flashy and immediate fashion. That’s a good each way bet as far as we are concerned. Lastly we like companies that put on the brakes when the markets look historically hot. One proxy for this is gearing at the company level. The chart below (Figure 4) clearly shows where Mirvac is diverging from the crowd in terms of balance sheet conservatism (and another way of thinking about this is being cashed up for opportunity). At around $2.20 (current levels) Mirvac is good value.